The American GDX Gold Miners ETF is slowly becoming the de-facto standard for measuring gold-stock performance. Nearing its eighth birthday, GDX has even usurped the venerable HUI gold-stock index as this sector’s metric of choice in many circles. While GDX has advantages and disadvantages compared to the traditional HUI, it is an excellent gold-stock benchmark. But it still falls far short of individual stock picking. Gold-stock speculation and investment isn’t easy. Like any sector, it takes a great deal of experience and expertise to understand what the miners and explorers are doing and separate the wheat from the chaff. In some ways, analyzing gold stocks is even harder. As the consummate contrarian sector, gold stocks get very little coverage in the mainstream financial press. So the best of breed aren’t widely known. This relative information vacuum leaves gold stocks somewhere between a challenge and a minefield for individual investors. Without the time or resources to spend years intensely studying this obscure little sector, it’s virtually impossible to pick the winners. This gap left by Wall Street’s total disinterest has been filled for decades by financial newsletters. Rare contrarians like us do the heavy lifting and sell our results. Back in early 2006 as the exchange-traded-fund boom was just ramping up, gold stocks were actually flying. The flagship NYSE Arca Gold BUGS (Basket of Unhedged Gold Stocks) Index, better known by its symbol HUI, had rocketed 98.4% higher in just over 8 months! Excitement in gold stocks was as great as it’s been in their entire secular bull, a perfect environment for Van Eck Global to launch its GDX ETF. While ETFs are common and ubiquitous today, GDX was revolutionary at its birth. It gave individual and institutional investors and speculators an easy and efficient way to get instant diversified exposure to the world’s best gold-mining stocks. The fund’s custodians did all the hard ongoing research work, aided by market capitalizations which always separate the winners and losers. GDX proved a success. With decades of experience studying and trading gold and silver stocks, we were never super-interested in GDX at Zeal. Diversification is important, but a smaller handpicked portfolio of the best elite stocks will always outperform a larger diversified one. So we stuck to our old game of ferreting out the best gold and silver stocks to buy individually. But we kept close watch on GDX, over 6 years ago I wrote my first essay on it. Now on those rare days when gold stocks are discussed on CNBC, the HUI is never mentioned. In this new ETF-dominated world, the dominant ETFs have replaced minor sector indexes as the leading benchmarks of choice. So to mainstreamers not steeped in gold-stock trading experience, GDX is the gold-stock sector. So we’re long overdue for revisiting its construction, components, and performance. GDX tracks its own modified market-capitalization-weighted index, the NYSE Arca Gold Miners Index. Market-cap weighting is without a doubt the best way to construct an index. Over time in free markets companies are stratified by their market caps, which reflect their past successes, current execution, and future potential. The winners are bid up to higher market caps, while the losers are sold down to lower ones. 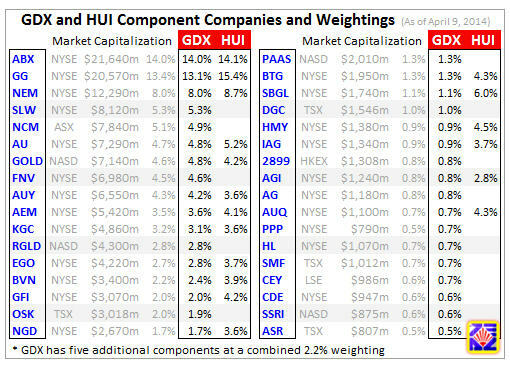 GDX currently has 39 component companies, the largest 7/8ths of which are listed in this table. Their market capitalizations and relative market-cap weights within this population are shown, along with each company’s weighting in GDX and the gold-standard HUI. GDX is quite interesting, both similar to and different from the HUI. Its custodians have done a great job in creating a fine gold-stock benchmark. GDX’s best attribute after ease of trading and instant diversified gold-stock exposure is the smart way that its components are weighted. GDX’s weightings are virtually identical to their relative market caps among each other. This avoids the common ETF pitfall of custodians subverting the results of free-market bidding to impose their own biases on their portfolios. The best companies win the largest market caps. This weighting methodology is better than the HUI’s. With only 18 component stocks compared to GDX’s 39, market-cap weighting is a lot harder. So the HUI’s custodians essentially assign the top two companies a weighting near 15% each, the third around 10%, and then split the remaining 60% among the remaining components roughly equally. This gives the smaller companies an outsized index impact. That would be fine if they were the best of the smaller gold miners, but unfortunately they aren’t. Some of the highly-weighted smaller-market-cap components of the HUI have had big problems ranging from production issues to poor management to geopolitical challenges, and their performance has suffered. If a better subset of the smaller gold miners shown above was picked, the HUI’s performance would improve. Another neat attribute of GDX is it doesn’t just hold American-traded stocks like the HUI. GDX offers exposure to gold and silver miners that trade in Australia, Canada, Hong Kong, and the UK. This overseas contingent isn’t huge, at 11 of the 39 component stocks but less than 1/8th of all GDX stocks’ total market capitalization. But it’s still a nice bonus to get international exposure unavailable in US markets. As all experienced gold-stock traders know, the American stock markets are no longer the venue of choice for emerging and growing explorers and miners. Unfortunately crushing regulations here in the US have made the cost of doing business far too high for smaller companies, so many choose to list elsewhere instead. Canada is now the dominant world leader, so it’s important to be able to trade on its exchanges. GDX certainly has drawbacks too, the chief one being its annual 0.52% management fee. Every year a half percent of GDX is siphoned off to pay its custodians for their services. This is reasonable, as they deserve to be compensated for their hard work like everyone else. My main concern is this ongoing yearly cut making GDX less desirable as a long-term gold-stock tracker like the HUI, which has no fees. Major gold-stock moves play out over secular time spans. Across nearly 11 years leading up to September 2011, the HUI rocketed an astounding 1664% higher! Vast fortunes were won in gold stocks. Analyzing the ebbs and flows of this epic bull run to determine optimum buying and selling timing required digging deeply into past data. Is GDX comparable over multi-year spans like this with fees constantly coming out? Another drawback of GDX is the fact it has so many component companies. Over-diversification is a certain risk to long-term performance, and 39 components is a huge portfolio. Over decades of trading and studying the markets, I’ve found that an optimal portfolio size is 10 to 20 companies. Academics have verified this real-world experience of many traders, that after 20 the benefits of diversification rapidly diminish. An ideal portfolio is a single company, the one that is going to have the best performance over your holding period! But since we mere mortals can’t see the future, we can’t know which one stock is going to fly far beyond the rest. So we diversify, spreading our bets to have a greater chance of catching that one with the best gains. This also reduces company-specific risk, which is very serious in gold mining. Unfortunately gold deposits and mines are inexorably locked in specific places. So miners are at the mercy of their host governments. Unlike most producers that can move factories to other countries if one country burdens them too much or hikes tax rates too high, gold miners don’t have that option. Owning 10 to 20 elite gold and silver miners reduces the overall impact if one falls sharply on some geopolitical problem. At Zeal we run two portfolios, one around 10 stocks in our monthly newsletter and one around 20 in our weekly newsletter. And with 664 realized trades over 13 years or so, the vast majority of which are gold and silver stocks, the tyranny of the bell curve couldn’t be more apparent. No matter how much we research, our portfolios always seem to have bell-curve distributions of returns. This is true of all professionals. Every expertly-handpicked portfolio has a big winner or two on the right side of the bell curve, a big loser or two on the left side, and the bunch in the middle with varying degrees of average performances. And these tails don’t seem to grow much as your portfolio size grows. So getting over 20 companies reduces performance since it dilutes the right-side winners’ massive gains with a larger pool of average gains in the middle. The GDX and HUI both share another serious problem endemic to the small gold-mining sector, an overemphasis on the major miners. This week, GDX’s 39 component companies had a total market cap of just $154b. This is vanishingly small in the context of the broader stock markets. At the end of March, 21 companies in the S&P 500 had individual market caps greater than the total of all of GDX’s components! One of the reasons gold stocks can soar so fast when they start to regain favor is the tiny size of this sector. They are less than 0.9% the size of the S&P 500. But within these GDX components, the top 5 alone account for a whopping 46% of all components’ total market cap. So just like the HUI, GDX’s price action is dominated by a handful of major gold and silver miners with stock prices that have stagnated. So a bet on both GDX and the HUI is largely a bet on the major gold miners. While these are certainly the largest and safest in this sector, I don’t think they are best of breed. Their weak share prices reflect their great challenges in recent years of profitably running and sustaining large multi-mine operations. All the gold-stock price gains haven’t been in the majors, but in the smaller growing gold and silver miners. The smaller miners have a huge price-appreciation advantage with their smaller market caps. GDX’s top 5 and 10 components have average market caps of $14.1b and $10.4b. It takes a lot of capital flowing in to move such large stocks higher, big market caps have far more price inertia. But everything below the top 10 has an average market cap of $1.7b. It is vastly easier for a $2b company to triple or quadruple than a $20b one. So if you built your own portfolio by just lopping off GDX’s top 5 or 10 holdings and buying the rest, it would far outperform GDX. But why not go even farther? Why not just pick the 10 or 20 smaller and mid-tier gold and silver miners out of GDX with the best fundamentals and best prospects? This elite subset of the gold-mining sector should easily double the headline gains, and probably achieve even more. That’s what we do at Zeal. We’ve spent decades endlessly researching the universe of gold and silver miners and explorers to uncover the best of breed. And then we build high-performing portfolios of these, attempting to buy low when gold is out of favor. If you have the capital, there’s no sense being stuck with owning every major stock in a sector when you can instead handpick the highly-likely winners. Back to using GDX as a benchmark, how does it hold up compared to the gold-standard HUI? This next chart compares the two over the last 7+ years. Despite their considerable differences, their performance is functionally identical! These two lines are totally interchangeable, no one could tell the difference. Why? Because both the ETF and the index are utterly dominated by the performances of the same major miners. GDX’s international exposure, its over-diversified portfolio size, and its management fee would seem to be enough to differentiate its performance from the venerable HUI’s. But there is virtually no difference. During gold’s major uplegs and corrections of the past 7 years or so, GDX’s price action and performance has been virtually indistinguishable from the HUI’s. So for all intents and purposes, GDX is the HUI. This is not only true visually, but mathematically. Over the entire span of this chart since the dawn of 2007, the GDX and HUI have had a stellar correlation r-square of 98.5%! This is astoundingly high for an r-square, just off the charts. 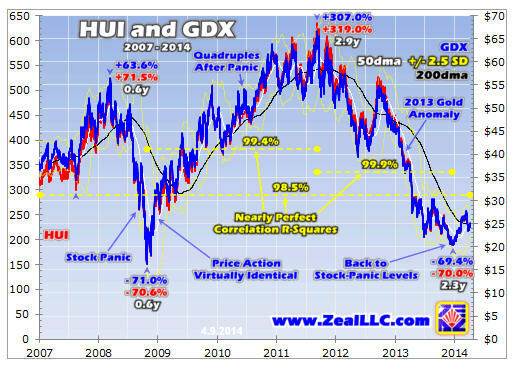 It means 98.5% of the daily price action in GDX is statistically explainable by the HUI’s, or vice versa. And within the last great upleg and correction, this relationship was even stronger. When gold stocks more than quadrupled out of late 2008’s exceedingly irrational and fundamentally-absurd stock-panic low, the GDX and HUI r-square climbed to 99.4%. And in the subsequent correction that cascaded into a brutal cyclical bear in last year’s extreme gold-selling anomaly, this number shot up to an unheard of 99.9%! This almost bothers me, as GDX’s major differences should lead to different performance. But they haven’t, because the major gold and silver miners dominate both the ETF and the index. This has all kinds of implications for investors and speculators. On the macro level, GDX is obviously as good a benchmark as the HUI despite its management fees. After living and breathing the HUI for 14 years it will be hard for me to switch and think in GDX terms instead, but that’s the way the world is heading. GDX’s excellent tracking of gold-stock performance will also make it the destination of choice for mainstream capital looking for gold-stock exposure. This is a double-edged sword. On the good front, traders putting differential buying pressure on GDX threaten to sever its tracking of its underlying gold-stock index. So those capital flows must be directly equalized into the underlying gold stocks themselves. Thus GDX’s custodians absorb excess demand by issuing new shares. The resulting cash they raise is then shunted back into the gold stocks, lifting the entire sector. But the bad part of this is GDX will deploy new capital based on its weightings, determined by its components’ market caps. So all these gold stocks will get a boost from GDX buying instead of the half-or-so subset that are most deserving of capital inflows. So if all gold-stock investment happened through GDX alone, the performance of the gold stocks would be totally homogenized. Thankfully that is not the case, with the vast majority of gold-stock buying done outside of GDX. How can we know that? GDX’s market cap is only around $8.1b, just 5% of the total market cap of its component gold stocks. So experienced stock pickers will still shine in the gold-stock realm. And that’s what we are at Zeal. We only want to own the elite best-of-breed gold and silver stocks with the best fundamentals, best projects, and best management. So we research these sectors year-round. We recently finished our latest project looking for the world’s best growing mid-tier gold miners. We published a fascinating 32-page report detailing our dozen favorites with the best fundamental prospects. Interestingly 9 of those are included in GDX, with average market caps of $2.8b. There is no doubt this elite subset will far outperform the broader GDX dominated by the majors. You can easily build your own custom portfolio of best-of-breed growing mid-tier gold miners that will trounce the broader gold-stock metrics. And what a great time to buy when gold stocks are dirt-cheap and deeply out of favor. Buy your report today! My business partner and I have spent a combined 25 years studying and trading gold and silver stocks full-time, yielding a vast treasure trove of hard-won experience, knowledge, and wisdom you should harness for yourself. Our acclaimed contrarian weekly and monthly newsletters will keep you abreast of the markets and trading opportunities. Since 2001, all 664 stock trades recommended in them have averaged awesome annualized realized gains of +25.7%! Subscribe today and start sharing in our labors’ profitable fruits. The bottom line is the GDX gold-stock ETF has grown into a fine sector benchmark. It has far more, and many better, companies than the flagship HUI gold-stock index. And despite its reasonable annual management fee, its performance has nearly exactly mirrored the HUI’s. Investors and speculators who just want basic diversified gold-stock exposure are well served by GDX, it tracks gold stocks perfectly. But unfortunately the gold-stock sector is dominated by a few major miners, and their performance will always fall short of the smaller miners growing beneath them. So investors and speculators willing to build a smaller still-diversified portfolio of elite best-of-breed gold and silver stocks will enjoy far greater gains than GDX can ever provide. That is a heck of a lot more appealing than settling for mere sector performance!